Missouri National Guardsmen participate in some early morning interval running as part of the new Unit Fitness Coordinator Course, run by the 140th Missouri Regional Training Institute at Fort Leonard Wood. FORT LEONARD WOOD, Mo. 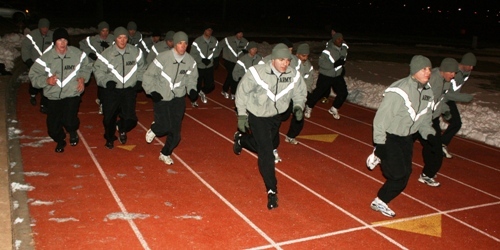 (Jan. 19, 2010) — The 140th Missouri Regional Training Institute is offering a new course that will promote the Missouri Army National Guard’s goal of total fitness. The Unit Fitness Coordinator Course is designed to train officers and noncommissioned officers with physical fitness knowledge and skills that they can take back to their units to promote a healthy lifestyle for all Soldiers. With total fitness as the goal, Richland resident Spc. Rita Brumley, from the Headquarters and Headquarters Company of the 35th Engineer Brigade on post, said it is important that the Guard find an educational way to teach its soldiers to be physically fit. Diet tracking and interval running are methods Brumley plans to implement within her unit to improve physical fitness. Brumley has been in the military for more than six years and says this is the best program she’s seen to help soldiers break up the monotony of typical physical training. The Guardsmen who take on that responsibility will have the additional duty of working with the company commanders and leadership to mold each unit into more physically and mentally fit soldiers, in and out of uniform, Campbell said. “It will be about more than improving scores on the Army Physical Fitness Test,” said Campbell, who lives in St. James. “It’s also about health and wellness that will allow each soldier to be a better individual health-wise, as well as more combat ready and effective when they do deploy. In a classroom setting, soldiers who go through the week-long course will cover topics that include nutrition, diets and myths, metabolism, body mechanics, muscle and bone structure, cardiovascular fitness, strength training, effective workouts, counseling, weight control, lifestyle change, how to run a physical training program and how to administer an Army Physical Fitness Test. The field training part of the course will be students going through varying morning and afternoon physical fitness regimens. “That teaches soldiers a variety of ways they can train, whether it’s muscular or cardiovascular training,” Campbell said. The physical training sessions cover dynamic warm-ups, track running drills, plyometrics, traditional physical training within formation and interval training. Students also learn to incorporate exercises using stability balls, stretch bands, aerobic steps and various weight training equipment found in gyms. Making physical training fun is an overall theme, Campbell said. At the direction of the adjutant general, the regional training institute created the program and Campbell, a biology teacher and track and field coach at St. James, used his expertise to tweak it. Because physical training can often be accomplished using different methods, or can simply evolve, Campbell encourages class discussion and will alter the design of the course as needed to advance learning within the class. Because physical training can often be accomplished using different methods, or can simply evolve, Campbell encourages class discussion and will alter the course design as needed based on advance learning within the class. “We have students who have strong backgrounds in health,” Campbell said. “We have an EMT, a nurse and a former fitness trainer. So we’re taking their input to improve the next course and the course after that. The first class began Jan. 11 with 18 Guardsmen. Sgt. Brennan Cox, from Headquarters Support Company of the 935th Aviation Support Battalion in Springfield, said the best thing he’ll take from the course is the different ways to do physical training. Through the course, Cox said he’s learned some ways to help fellow Guardsmen seek a better fitness level. “We are trying to focus on how we can implement our healthy lifestyles into the lives of those who are having a hard time doing so,” he said. “One thing I’ve definitely taken from this course is learning the different components of muscles and the different values in nutrition that we can pass on to those back at the unit. Capt. Dustin Berry, of the 70th Troop Command in St. Louis, said the new course is a way to ensure the Missouri Guard maintains the highest physical fitness standards. The course, Berry said, should help raise those standards. “I think that for most fitness leaders in their units, they need some type of mechanism to teach and to show other soldiers, ‘These are some things you can do to help your physical fitness,’” said Berry, who lives in St. Louis. “We’re not here to be doctors or dieticians; we’re here to help average Soldiers do better on their Army Physical Fitness Test and be more combat effective.